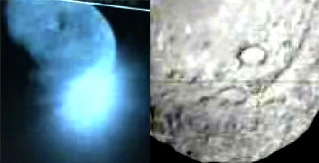 The left photo is from the flyby craft mere seconds after impact, and the right photo is from the impactor craft just minutes before it hit. Here are better images from SpaceflightNow. Now, the flyby craft is in “shield mode” as it passes through the comet’s coma, facing its cameras away from the blast of icy particles surrounding the comet nucleus. After it gets past that, it turns towards ground zero on the comet surface and gets the highest resolution photos of the impact yet. So far, the JPL people are saying that the impact is coming out bigger and brighter than any of them expected. SpaceflightNow’s Deep Impact mission status updates. The Planetary Society’s Deep Impact section. You get the NASA TV feed over the net, right? Yeah, WMP feed here, but it’s pretty lossy. Gah! I’m getting Starflight flashbacks from your animation.